Distilled Witch Hazel is a topical astringent for temporary relief of sprains, bruises, sores and insect bites. Distilled Witch Hazel Directions for use: Bathe the affected parts freely and if possible apply a compress moistened with the extract and keep it moist until relieved. 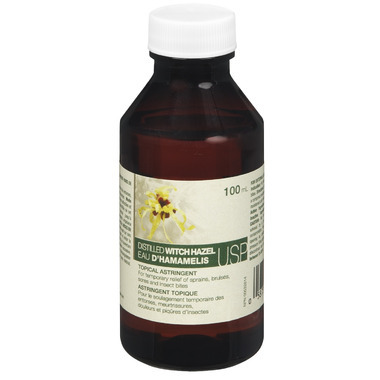 Distilled Witch Hazel Active Ingredients: Hamamelis virginiana linne. Distilled Witch Hazel Inactive Ingredients: Alcohol, Water. Glad to was a small bottle, ordered months ago and only now had the opportunity to use it, so this infrequently used solution at least takes up little space in the medicine cabinet. Dabbed on numerous mosquito bites and found instant relief to be able to get back to sleep at night. Excellent. Product is okay. The bottle is really small!!! I expected a larger size (my fault for not paying closer attention to the sizes, instead of relying on the pictures). I'll look for better value next time. Wish it came in larger size- went quickly when using for my homemade bug repellent. Used it as an ingredient in mosquito repellent and it works great. I use this product when I make home made bug repellent. It has many different uses. You can use it as an astringent for you skin also. I use this to make homemade bug repellent. 1 part of distilled water, 1 part of which hazel and 10 drops of clove essential oil. Wonderful inexpensive products. I put it in a small spray bottle and it calms all itchiness anywhere in the body. Used this for making natural insect repellent along with jojoba oil, and essential oils but will now have to try it 'straight up' as recommended in other reviews. I wouldn't be without this. It works on stings, bites, sunburn, puffy eyelids.... I have put some in a small sprayer bottle for a face refresher. I would love it if it came in a larger bottle and maybe a travel size. Hard to believe that what looks and feels like water, as this does, can be so effective in calming the skin! Seems to help with everything, and skin can be saturated without stinging or neg effects. This is great! I use it in combination with essential oils to make a natural fabreeze! Smells great and works well! Love this stuff, great quality! It has so many wonderful uses for the whole family! Just google it! I'll be using it for upcoming home birth, both for coating women's products for freezer for relief after, as well as mixed with warm water in peri bottle. I use witch hazel every day after cleansing my face. I'm so happy that well.ca ships this! Note the 100 ml bottle size is good for travel but you will have to order a few bottles at a time for home use. I use this as a toner after cleansing and find it works perfectly and doesn't dry or tighten my skin. I wish that Well sold a Witch Hazel that was not distilled in alcohol but this works for me for now. Great product. I'm using it as a toner and it doesn't try out my skin at all. Great as a natural toner/cleaner/refresher on my face. Also helps with dandruff/dermatitis on my scalp. My only complaint is the size. It would be nice to have the 500ml available, as a 100ml bottle is kind of wasteful. I used to get the 500ml at my local drugstore but it's hard to find these days. Luckily a search for witch hazel is how i found Well.ca in the first place! I love this product. Very soothing and works well for me. Would definitely buy again! Very good product. i also use it to clean my scalp. Very soothing. It is very difficult to find in retail stores so appreciate the availability here. I use this product as a toner after washing my face. It works well. Witch Hazel is an excellent product - especially for hemorrhoids - soothing and works well. Great toner! BIGGER SIZE PLEASE :) I use it as a toner, my boyfriend also uses it on his acne. I don't mind sharing but i don't want to be buying it repeatedly if i can just buy 2 big bottles. Great for acne. I also love to clean my scalp with witch hazel. I bought this astringent for a mild problem with pimples caused by a medication. It seems to be doing the trick and leaves the skin feeling better than brand-name aftershave lotions. Excellent to have at home, so many uses. We always have this in the medical cupboard. I wish Well carried a larger size. Perfect. Larger size would be needed, though. Wonderful to have around the house. My daughter uses it with acne breakouts, it works for her. Great product! I used it on razor bumps after shaving and it helped to clear them up very quickly. I also use it on any other scrapes or cut I get and it helps to heal them up faster than they would on their own. The only downside is the smell. It's not particularly pleasant, but not the worst either. Definitely worth baring through the odour for the great results it gives. I love this product. I bought it to use as an antiseptic for cuts and scrapes, but ended up using it as an astringent. I just it every night after I take my makeup off. My skin feels so smooth and it has shrunk my pores, an added bonus!!! I really like witch hazel - it is gentle on your skin. I also like to use salisylic acid on my skin, but I always mix it half and half with witch hazel. Lovely stuff, much gentler on my face than the kind available in most drugstores. Will re-order. I bought this to make a homemade toner for my skin and really like it. I added a few drops of lavender essential oil to it as well. I love the soft scent that is left on my skin and the clean feel as well! My family and I are trying to go a bit 'greener' and witch hazel is a definite step in that direction for the makeup AND medicine chest. I agree with Barbara - can you get a bigger bottle? This is great witch hazel. I love it as a skin freshener as well as for the medicine chest. Just wish it came in a bigger bottle -- it's a bit pricey for the size. I'd give it a 5 out of 5 only for that. My cheecks are usually red, a friend suggested that this would help to eliminate the redness. It does make a signigficant difference. From a stricktly vain stand point I love this product.